If you’re hosting a smaller group for Thanksgiving this year, grilling a whole turkey might be more food than you need or want. To avoid a fridge full of leftovers - try grilling a turkey breast, which depending on the size of your group’s appetite is perfect for about 4-6 people and takes much less time to cook than a traditional, whole turkey. I created a flavorful compound butter using citrus and fresh herbs, half of which is used to rub between the skin and the meat, and the other half is melted and basted on to the skin of the turkey to create a flavorful, crisp, golden brown skin, which in my humble opinion is the best part of the turkey anyway. This recipe is prepared on a charcoal grill but you can easily adapt this for a gas grill or even a Weber smoker. Start by creating a medium-hot fire (about 350-400 degrees) with an indirect cooking zone. I like to use the Weber char-baskets to bank the charcoal to each side of the grill, and a large disposable drip pan in the middle. Soak apple or cherry wood chips in water for about 30 minutes, then sprinkle the drained wood chips on the charcoal. 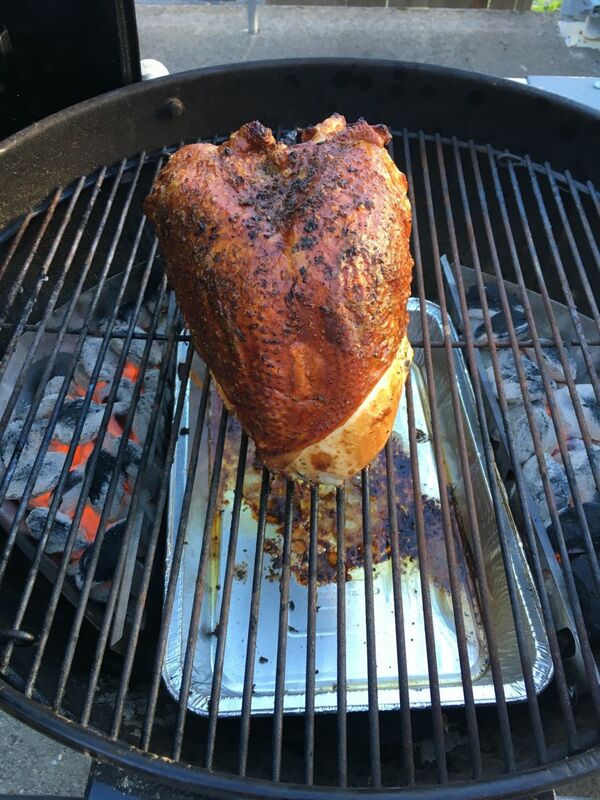 Once the wood is smoking and the temperature is set with your iGrill, place your turkey breast upright on the grill over the indirect zone, it should be able to stand up on its own but you can use a roast holder if you need. Close the lid and let the turkey breast do its thing. Note: Recipes often call for unsalted butter, but I prefer salted butter in this recipe as it’s the only salt used and I think it helps season the hard to reach meat underneath the skin. Blot the turkey breast dry with a paper towel and trim off any excess skin or fat. Place the turkey breast on a rimmed baking sheet and let sit out at room temperature for 1 hour. Soak wood chips in water for at least 30 minutes. In a medium bowl combine the softened butter, mixed herbs, lemon zest and orange zest. Use your index finger to gently loosen the skin, (leaving the skin attached and being careful not to poke holes in the skin) from the turkey breast and carefully rub half of the butter mixture all over the turkey breast. Prepare the grill for indirect cooking over medium heat (350º to 400º) and place a large disposable drip pan in the middle of the charcoal grate between the char-baskets. Once the grill has reached the desired temperature, brush the cooking grate clean and place the drained wood chips on the charcoal. Melt the butter and stir the lemon juice and orange juice into the remaining mixture. Brush the turkey skin with the melted butter and grill the turkey breast, skin side up, positioned over the foil pan, over indirect medium heat, with the lid closed, until the skin is golden and the internal temperature reaches 165º in the thickest part of the breast (not touching the bone), 1 to 1 ½ hours. Baste the turkey with the melted butter every 20 minutes or so.